The third issue of Literacy Lava, a digital magazine (in pdf format) is available for you to read, download and use, share with others, or print and keep. As usual, Literacy Lava is erupting with great tips for parents, and suggestions for literacy activities to share with kids. 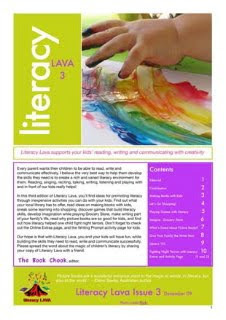 Grab the third issue of Literacy Lava! now, by clicking here! ... children's Christmas book? Went to the bookstore and was underwhelmed by the selection there. Let me know what your favorites are! I'll share some of mine once you guys get the list going. I try to make weekly library trips a routine/tradition with my son. I've been doing a poor job of maintaing that routine lately though. Life gets busy, and honestly, library trips with my toddler have been pretty frustrating recently. He's all over the place! He wants to get into everything that he shouldn't be. I just want to read with him! Or I would at least like to see him somewhat interested in picking out some books. I can barely corral him though. He just wants to run around. And I don't want to have to contain him to his stroller (which doesn't work anyway). So I got online and starting digging around for some tips that might help make our library trips more enjoyable for... well, ME, honestly! 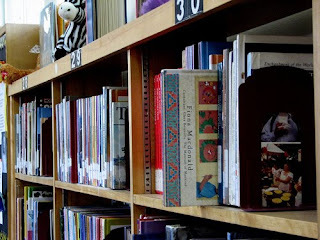 - One ideas I found was to read a book or watch a video about going to the library before you make the trip. This way your child will know how to behave and what to expect. I'm skeptical about how helpful this will be, but I'm willing to try anything. Wasn't there an Arthur episode about visiting the library? I'll have to look into that. He loves Arthur books. - Visits to story hours are suggested. It's so tough for us to make it to those on time though! :( I'm going to keep my eyes peeled for some special Christmas story time activities at the libraries. - Letting them play with the toys and equipment and you choose the books for them for reading at home was another idea. I think this is where a big part of my problem comes in. Our local libraries are lacking in children's area toys and equipment. Puzzles are pretty much all they have beyond the books. (This is probably why my toddler resorts to playing the trash cans.) Plus, I would like my toddler to be somewhat involved in choosing their books. Perhaps that's simply too high of an expectation at this point. I've been considering talking with my toddler, and making a list of the books (or kinds of books) we're going to look for at the library before we leave. So even if he doesn't want to help while at the library, he is still playing a role, and this gives us another chance to discuss the library and the kinds of books we can find there. - Let my toddler watch me checking out my books. Let him hand the librarian our library card and talk about how he will have his own library card someday. - Take my toddler to the section of books I check books out from for myself, and let him see me choosing my books and enjoying them at home. - When you read a library book at home that you really like, talk about how it came from the library! Get them excited about finding MORE great books at the library. What tips and ideas can you share for making the most of a library visit with a toddler? What's A Rhyming Unit WIthout Some Dr. Seuss? ... Not much of a rhyming unit at all, if you ask me! So we finished out the month with There's A Wocket in My Pocket. Again, and easy reader, but one of my favorite read alouds! Seriously! I think I like this one even more than Put Me In the Zoo. The silly words are so much fun (for me), and they draw each and every student in like magic. My favorite part about reading this one is when I get to stop and ask the students very seriously if they've ever had a "yink in their sink," or a "nooth grush on their tooth brush." You would be amazed how many of them have! I never know what to expect with each group when we get to the "vug under the rug." I like to lower my voice to a kind of spooky whisper when I read this page. They love it! And they assume I know what that vug under the rug looks like (it remains concealed in the illustrations), like I've got some in with Dr. Seuss and he let me take a peek at it. You can tell Christmas is in full swing when one of my students insisted that the vug under the rug really was just Santa. She wouldn't let it go. We had to make some silly creatures of our own to take home! We got to mix and match heads, legs, and bodies of our choosing to make 'em. How fun! They were each unique. 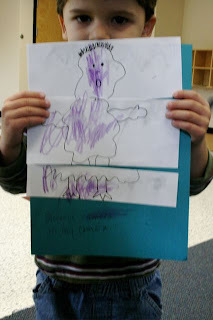 One of my students chose to make his creature entirely out of feet pieces! A while back I wrote a post describing, and commenting on, a specific library story time I attended with my son. I received a great comment today on that post and wanted to use this post to respond to it. I'm hoping the commenter, Leslie, doesn't mind me sharing her comment in this post. Hi! Thanks for sharing your thoughts on story time. I am a children's programmer in Wisconsin, and the "story hour lady" at a very lovely public library. I found your shared experience very helpful, as I am continuously tweaking my story hour plans here at the library. I just wanted to respond to a reply to a comment about librarians providing parents with a place to socialize with other parents - I am wondering if this misconception is what contributes (in some instances) to poor story hour experiences? I think what most libraries are attempting to do is promote early literacy with young children by introducing them to words, rhythms, music, and exploratory experiences. They are also trying to provide parents with a positive example of things to do at home with their children. Story hour should not be, in my opinion, a place to socialize with other parents, but rather a family learning experience and a place where parents can interact purposefully with their youngsters. One of my biggest challenges it seems is less with the behavior of children (I encourage interaction and movement)and more with the parents - parents who talk and whisper with other parents while I read, or parents who disengage and read a book in the back, or parents who ! choose not to step out when their child is clearly overstimulated, upset, and ill. I also wonder at age-appropriateness of discussion. Songs, fingerplays, and crafts are all meant to take the place of discussion by offering children the opportunity to explore. I think questions should be encouraged, and I definitely do ask many questions of my 2 year olds and toddlers. I was wondering if you had a more specific example of the kind of pace, discussion, and observations you expect from a library story time. I also would LOVE to know what you think about the parent's role at Story Time and what ways I, or another librarian, might better embrace and guide parents toward more fruitful story hour interactivity, etc. I completely agree with Leslie's thoughts about parents socializing during story hour. Unfortunately, I think socialization is often a big motivating factor that draws parents of little ones to these story hours. Not that parents socializing is bad. But it should be saved for before and after story time. How can we expect our children to act appropriately during story time (being attentive and engaged) if we can't do the same ourselves? We need to be modeling and setting an example. Our focus should be on our children and our energy should be put into enhancing and making the story time lessons and activities accessible for them. If we want them to value and enjoy story time, let's value and enjoy story time too! - Discussion of the parts of the book. I like to see the librarian talk about (even briefly, in casual conversational way as she reads) the cover, the title, the pages, the author and illustrator and what they do, etc. - Discussion of the text and illustrations. Nothing extremely in depth or too lengthy. I just like to see the librarian define a few new vocab words from the story, point out interesting things in the illustrations, make some connections between the story and the children's own lives... That kind of thing. Too much discussion distracts from the story, but discussion can be saved for before and/or after the story if the librarian is worried about that. 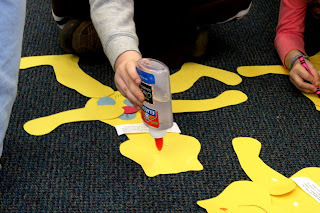 - If activities (crafts and such) are done, it's nice if they are age appropriate and are properly incorporated with the story or the theme of the story time. 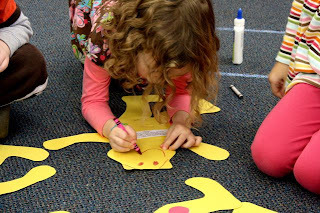 I attended a preschool story time once that had an age appropriate craft, but there was little to no connection made between the craft and the story. The story time simply ended and the parents were invited to help their children with the craft. I suppose in that situation, it's not unreasonable to expect the parents discuss the story with their children as they do the craft and make the connection, but many don't. 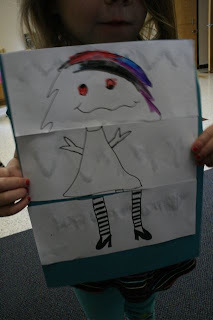 And this kind of comes back to that whole idea of modeling; some parents need the librarian to model how to discuss the story and enhance a child's understanding of it through a craft or activity. I believe that in many cases, it's the parents that should be learning from the story time just as much as their child is (just in a different). - A laid back, leisurely pace is always nice for any story time. Librarians should be careful not to plan too much or try to squeeze too much into one story time session. Story times are held on such a regular basis, seems like there would be plenty of time for various activities, songs, games, fingerplays, by simply varying the plan for each story time. I hate feeling rushed with my students, and I never feel like my students get as much out of our lessons when they are rushed. It ends up being stressful for all of us. - As a parent, simply seeing the various stories (and book suggestions), rhymes, fingerplays, activities and how my child responds to them, this satisfies my appetite for literacy training and encouragement. Our librarian has thrown in info and instruction during story time by simply taking time to say things like, "Repetition is good at this age. It's O.K. to read your child their favorite story over and over again." She has taught some sign language and encouraged that. She advertises books, authors, programs coming up at the library, etc. - I would love to see (or even do myself) a class with families on how to read a story with your child. I've heard of programs like this. The instructor/librarian/teacher teaches the parents how to maximize learning during lap reads with their children. I think the families often get to take the featured book home with them at the end of the class too. Just some random thoughts. My two cents. Take from it what you will, and please add your two cents in the comments. What did I miss? What did I get wrong, in your opinion? Share! I know I use this excuse WAY too much, but life has been super busy. It's almost midnight and I'm just now remembering my blog post! Yikes! I swear, this adoption is giving me dementia! So no post tonight. I have high hopes for tomorrow. But for now, enjoy our snazzy blog button to help with one of our fundraisers. I would love it if you would post it on your blog and be a part of bringing our kiddos home. My poets that Didn't Know it! The rhyming continues, and my kiddos are getting better at it. Or perhaps just a little more comfortable with it and willing to participate more in our rhyming discussions and activities? Either way, we had fun, full lessons yesterday! And when I say full, I mean we ran like 15 minutes over with each group time. A good problem to have, right? They didn't miss lunch time so it was all good. We read Put Me In the Zoo (Robert Lopshire). There's not much to this story. It's a limited vocab book, but I love reading it aloud. My students always love it. It doesn't hurt that I bring my plush "Spot the Leopard" along with me when I read this one. Should I be offended that my students have WAY more to say to this plush animal than they seem to have to say to me? Ha! I get to combine two passions today in my blog post today (love when that happens): literature and the environment! I will be reviewing a "green" book. I'm reviewing Yucketypoo: The Monster That Grew and Grew by Jilly Hendersen-Long. This book was printed on FSC (product group from well managed forests and recycled wood or fiber) certified. This age target for this book is 5-7 yr. olds. But I think it could definitely be appreciated by a broader age range. Actually, I'm planning to read some excerpts from it to my preschoolers tomorrow for our rhyming unit! Yucketypoo is a compilation of poems focused mainly on the preservation of the environment. What I like most about Henderson-Long's writing is that its message is not heavy-handed. These are simply fun, whimsical poems that open a door to discuss environmental issues with little ones - environmental issues that are age appropriate. This isn't stuff that's likely to be over most children's heads. Dumped in a field, forgotten and rusty, leather seats stolen, steering wheel dusty, engine now gone and tyres so shoddy. Along came the monster. It now had a body. There are simple black and white illustrations that accompany each poem. They're a perfect fit, in my opinion. I have always been a big Jack Perlutsky fan, and Henderson-Long's poems have that Perlutsky feel to them. They roll off the tongue in an enjoyable manner. This isn't a book to be silently read to yourself. These poems beg to be read aloud! I can't wait to share these with my students tomorrow. 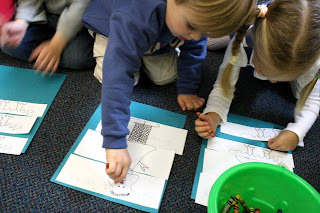 They'll be perfect rhyming practice for us, and should lead to some excellent discussion as well! Definitely worth checking out whether your an environmental enthusiast or not. Glad I discovered this one to add to my poetry collection! November is rhyming month! And working on rhyming skills with the students is always fun for me! And I hope it's as fun for my students as well. I would say we're off to a good start with this week's lesson! Lots of rhyming, and lots of fun! We read A Frog In A Bog (Karma Wilson). It's a rhyming story and a counting story (as one of my students so keenly pointed out). A frog eats lots of bugs and grows bigger and bigger and bigger. It reminds me of There Was An Old Lady Who Swallowed A Fly, only instead of the frog dying at the end, he spits out all the bugs and escapes getting eaten by an alligator. Yesss! 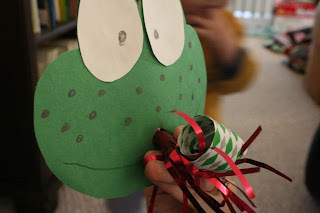 We made froggies to help us remember this rhyming lesson, and the students LOVED them! I heard they were talking about them well after they returned to their regular classrooms. I'm sorry I've been forgetting to bring my camera to class with me lately. I had to sub a photo I took at home after the lesson. :( From looking at the photo you can see the fun "tongue" each frog got. And on the end of the tongue? There was a fly, of course (plastic)! 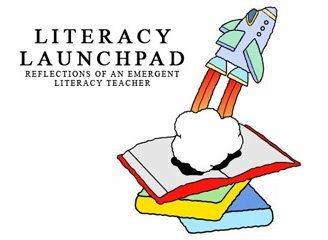 Reading Rockets - The Reading Rockets site offers tools and resources that can be used to encourage and teach children to read. Throughout this site, you will find information about reading instruction, classroom strategies, help for struggling readers, children's books and authors, videos, and podcasts. ReadWriteThink - ReadWriteThink features a large collection of tools that teachers and parents can use with students to support strong reading and writing skills. These tools can be integrated into any K-12 lesson plan to build strong lifelong readers and writers. Reading Is Fundamental - Within the pages of this site, visitors are provided with tips, tricks, ideas, and resources for motivating kids to read, choosing books, reading aloud, and much more. The Stacks - The Stacks, a beta site provided by Scholastic, features books, authors, games, videos, and a blog for encouraging children to read as they get older. This site offers a wide selection of books for all ages, book clubs, a reading community, and more. Highlights Teachers - For over 60 years, Highlights has been offering tools and resources to teachers for encouraging improved and lifelong reading in students. The Highlights Teacher site provides teaching resources, lesson plans, reading suggestions, classroom resources, online games, and interactive resources for kids. Education World - Education World, a huge education resource center, offers tools, tips, lesson plans, and many more resources that teachers can use in their language and literature classrooms. Most of the resources listed discuss ways to encourage and teach reading, lifelong literacy, help struggling readers, etc. Book Hooks - The Book Hooks site is a good site for students to share their love of reading with others. The site works by having students create book reports on the books that they are currently reading. 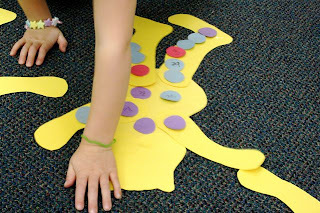 Book Hooks also provides resources, games, links, and news that students will find interesting. Enlighten Me - Verizon Information Services provides Enlighten Me, an interactive literacy site that offers a collection of informative articles designed to build strong readers and writers. Enlighten Me also has information on kid's books and an area for students to write their own book reviews. Absolute Whootie - Absolute Whootie provides online stories, folk tales, and children's plays that provide positive themes and encourage children to read. The stories within this site are illustrated by kids and include links to fun games. Cool-Reads - Cool-Reads is a book site where hundreds of books are reviewed by 10-15 year olds. This is an excellent place for young readers to get book recommendations. Stories from the Web - Stories from the Web offers online stories for children between the ages of 0 to 14. 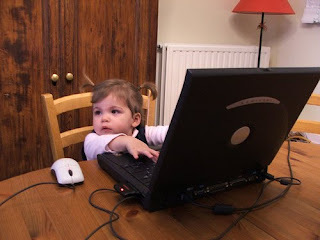 Within this site, children can read and write stories that are reviewed by others. 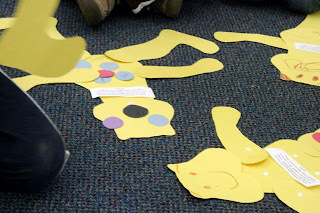 Literacy Connections - The Literacy Connections site offers a wealth of resources and tools that teachers can use to promote reading skills in children and adults. Through this site, teachers can find information on phonics, word study, children's literature, and language experience. Kids' Review - Kids' Review features book reviews written by kids for kids. The site gives students a reason to write about literature and helps struggling readers. KidsReads.com - KidsReads.com provides useful tips and resources that teachers and parents can use to find books that students of all reading levels will enjoy. The site also features reviews, author info, audio books, series recommendations, and more. Book Adventure - Book Adventure is a motivational reading program for children in grades K-8. Through this program, children can create book lists of over 7,000 titles, take quizzes, and earn points for literary success. Growing Readers for Life! - This blog works to provide tools, resources, tips, and articles that anyone can use to inspire a love of reading in young children. The site also features a free newsletter that visitors can sign up for. Jen Robinson's Book Page - Jen Robinson's Book Page is a blog created by a lifetime lover of children's books. Through her blog, Jen provides reviews, articles, and resources designed to inspire lifetime reading in all children. KIDLITOSPHERE - This blog is actually a society of bloggers looking to promote lifelong reading and literacy ideas through blogging on children's and young adult literature. The society offers dozens of resources for encouraging lifelong reading in students. Book-Pop - This virtual literature site offers animated web adventures for beginning readers. Throughout the site, visitors will find animated stories that children can read themselves as well as stories that can be read to them. Seussville - Seussville is an interactive site with Dr. Seuss books, games, printables, storymakers, and more.